Wearable sculptures to be used as part of dance performances, will be the focus of a new art installation which goes on display at the University next week. 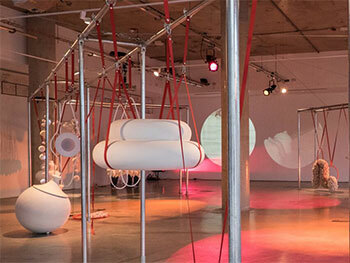 Our Parkside Gallery will host flockOmania2 – a hands-on contemporary jewellery experience aimed at exploring the relationship between jewellery, dance and performance. This year’s exhibition has been devised by Birmingham School of Jewellery researcher Zoe Robertson, and challenges the traditional conventions of jewellery display by hanging work freely in an open space, actively encouraging audiences to interact with the objects. Presenting jewellery in this manner creates an immersive environment which encourages performativity, audience interaction and response. We want the space to be seen as a ‘laboratory of making’ in which the audience is invited to interact; to touch, to play, to wear, and to explore. Zoe worked alongside Dr Natalie Garrett Brown from Coventry University’s Centre for Dance Research, and independent artist Amy Voris, to develop the concept. Each item has been handmade using a mixture of new technology, traditional craft skills and industrial processes such as ‘flocking’ – the process of depositing many small fibre particles (called flock) onto a surface. The exhibition which runs from Monday 22 February to Friday 1 April 2016, will incorporate a series of live performances. These performances will bring together sound, light, photography and film artists who will use the structures as part of their performance. Live performances will take place in the Parkside Gallery between 2pm and 5pm on Wednesday 24 February, 2 March, and 9 March with the finale scheduled to take place on Thursday 17 March 2016 from 6-8pm. The exhibition and live performances are both free to attend. For more information please visit the Flockomania website.